TV with Thinus: BREAKING. SABC chairperson Ellen Zandile Tshabalala must resign immediately after her public, party political canvassing, says SOS Coalition. BREAKING. SABC chairperson Ellen Zandile Tshabalala must resign immediately after her public, party political canvassing, says SOS Coalition. Civil society is calling for the immediate removal of the SABC chairperson Ellen Zandile Tshabalala who've publicly turned party political this past long weekend when she told residents of KwaMashu at a house hand-over ceremony to vote for the ANC and that too many political parties in South Africa are confusing. 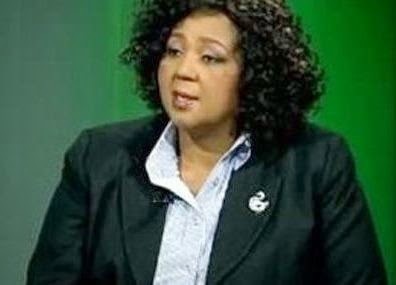 Ellen Zandile Tshabalala who became SABC chairperson last year and was/is an advisor to president Jacob Zuma on black economic empowerment, embarrassed herself and the SABC during a television interview on the SABC in February. Ellen Zandile Tshabalala, blamed apartheid and apartheid era tests for the shocking lack of skills at the SABC revealed in an independent skills audit conducted by PricewaterhouseCoopers (PwC). Ellen Zandile Tshabalala also ripped South Africa's print media, saying "people in this country vilify the SABC" because the SABC is "competition number one". As chairperson of the board, a month has passed with no word from the SABC board on what it has done regarding the PwC skills audit report, and no suspensions or clear action which has been taken over the Public Protector's shocking report into maladministration, abuse of power, irregular appointments and firings at the SABC. Implicated is the SABC's famously matricless Hlaudi Motsoeneng who is still in his job, has not been suspended, and who has the backing of Ellen Zandile Tshabalala. In a recorded interview Hlaudi Motsoeneng admitted to the Public Protector that he lied about having a matric, and made up symbols for a matric certificate he knew he could never produce. The Public Protector said Hlaudi Motsoeneng should never have been appointed at the SABC, and implicated him directly in the dismissal of all the SABC personnel who testified against him during a disciplinary hearing. The SOS: Support Public Broadcasting Coalition, a broad-based civil society pressure group representing the South African broadcasting industry, academics, TV production sector organisations, independent unions and institutes, is calling for Ellen Zandile Tshabalala to be removed after publicly doing political canvassing for the ruling party. The SABC board, SABC executives and journalists are supposed to be apolitical publicly at the public broadcaster which critics and commentators fear have become a state broadcaster doing the ANC political party's bidding. "Ellen Zandile Tshababala has crossed an important boundary of safeguarding the independence of our public broadcaster," says the SOS Coalition. "The SABC must be left alone and allowed to confine itself to doing its job which is to educate and and inform us without bias , without fear and favour," says the SOS Coalition. The SOS Coalition says Ellen Zandile Tshabalala needs to resign because of "her controversial support, and refusal to suspend the SABC's acting chief operating officer (COO) Hlaudi Motsoeneng despite very serious allegations of corruption and fraud" and her refusal to move ahead and implement the recommendations of the Public Protector's report. "Her proposal to take over as acting CEO of the SABC flies in the face of basic principles of good corporate governance," says the SOS Coalition. The SOS Coalition says Ellen Zandile Tshabalala needs to go and that the SABC board needs to "publicly distance itself from any form of electioneering" before May's general elections in South Africa. "The SABC board must once and for all publicly reject the outrageous call for '70% good news'," says the SOS Coalition - another hapless and misguided edict ordered by Hlaudi Motsoeneng.